You are here: Home » Featured » Priests from Where? Indonesian websites describe the country as a tropical paradise and ecological wonderland. Its lush forests, mist-enshrouded mountains, and palm-studded beaches draw visitors from all over the world. Komodo National Park, covering a large aquatic and terrestrial area between the islands of Sumbawa and Flores, is one of the most ecologically diverse regions on earth. The Indonesian archipelago includes a jaw-dropping 17,500 islands, with about 6,000 of them large enough to be inhabited. Of the 250 million people living here, an estimated 82 to 87% are Muslim, so well over 200 million people in this densely populated nation hold Islamic beliefs. It’s the highest number of any country in the world. The Indonesian climate is very warm, as most islands lie just south of the equator. Malaysia skirts the island of Sumatra, and Australia lies just to the south. About 2,700 miles to the north is the not-so-tropical southeastern tip of Russia. Here, in the city of Vladivostok, two American priests have served the Roman Catholic population for more than 20 years. Fr. Myron Effing, CJD and Fr. Daniel Maurer, CJD have been celebrating Mass, administering the sacraments, and instructing inquirers there since 1992. They arrived shortly after the official fall of communism in late 1991. Over the next few years, other priests trickled into Russia. By 2002, there were around 200—men who came from Poland, Slovakia, Italy, the United States, Argentina, and other foreign lands. The number fell off over the next few years, then stabilized. Today, this largest country in the world hosts fewer than 150 Catholic priests. That roughly translates to one priest for every 950,000 people. Bishops of the four Russian dioceses are constantly seeking new priests and praying for more seminarians. So are Fr. Myron and Fr. Dan. Their long-term hope, of course, is to have an abundance of home-grown priests—men who have grown up in Russia and who wish to spread the Faith among their fellow Russians. Russia’s divorce rate is sky-high. Within four years of the wedding, fully 75% of Russian marriages will end in divorce. By and large, children are raised by mothers or grandmothers, or they grow up in orphanages staffed entirely by women. As a result, most boys grow up with no fathers, no father figures, and no male role models at all. Not exactly fertile ground for producing future priests. So with the number of foreign priests in Russia having leveled off and with little prospect of native-born priests rising up any time soon, where are Fr. Myron and Fr. Dan finding the greatest source of vocations? In the most Muslim country in the world. 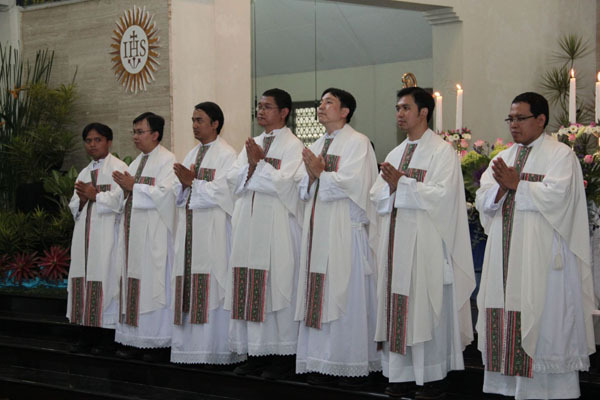 The island of Flores—the one adjacent to Komodo National Park—is teeming with seminarians. The island is about 4.5 times the size of Rhode Island, and has 1.4 million people. Flores has been the focus of sporadic bursts of missionary activity since the 1500s. Evidently, something took hold. Today, 85% of the population is Catholic. There are five minor seminaries and one major seminary, with a total of over 1,500 young men. A few years ago one of those men, Brother Inosensius Hetu, read about Fr. Myron and Fr. Dan on the website of the Mary Mother of God Mission Society (www.vladmission.org). Br. Ino liked what he saw and contacted the priests. Emails flew back and forth for a while, and Fr. Myron invited him to visit. Soon, Br. Ino was in Vladivostok, helping with the parish, studying Russian, working with the poor, and visiting children in orphanages. After completing his year of novitiate, Br. Ino returned to Indonesia. Word quickly spread about the work in Russia, the great need for priests, and the order that Fr. Myron had started earlier (Canons Regular of Jesus the Lord). Today, there are 29 young Indonesians in major and minor seminaries who have shown interest in joining the order for eventual work in Russia. And the interest has spread beyond Flores to other, nearby islands. 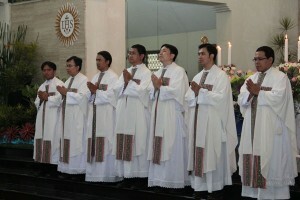 Just recently, four Indonesians came to Vladivostok to begin their year of novitiate. They will study, pray, and work together for the next 12 months, and gain an understanding of the life of a religious in Russia. People sometimes say that God has a sense of humor. Perhaps it’s actually a great sense of irony. How else could it be that American priests in formerly communist Russia are drawing vocations from the most Muslim nation on earth? Susan H. Gray is a Catholic freelance writer who has worked with the Mary Mother of God Mission Society (www.vladmission.org) since 1993. She has visited southeast Russia four times, and has seen firsthand the work of the Catholic Church in that region. She can be reached at susanhgray@centurytel.net.